22 bay, 300 yard driving range (tokens from Reception, £2.50) plus golf practice area which mimics a number of holes on the course with bunkers, a three tiered green, and plenty of uphill and downhill lies around the edge of the green. Buggies and trolleys are available for hire. The Clubhouse has all the benefits that you would expect from a club of this quality including: Fountain Suite with dining for up to 200 guests; The Terrace Room catering for up to 80 guests; Spike; Sports Lounge with large screen wall mounted TV; Patio/terrace area overlooking 18th green; Pro Shop; Spacious changing rooms. 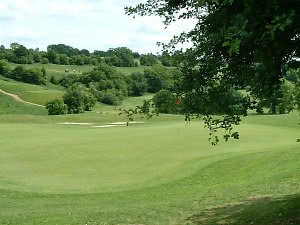 Surrey National Golf Club is set in an area of outstanding natural beauty in the village of Chaldon, near Caterham. Since opening in April 1999 the course has gone from strength to strength earning a fine reputation as one of the best all year round courses within the M25. Only a year after opening Time Magazine nominated the course as their "Find of the Year" and urged readers to "play it now"! Now with a superb clubhouse (opened Feb 2003 followed by an addiitonal wing in 2004)), the Club has gained a clubhouse to match the splendour of the course! This magnificent building sits perched above the 18th green with grandstand views over the lake, fountains and course beyond. It has all the benefits that you would expect from a new build plus the added bonus of stylish Hospitality facilities. On the upper floor, the spacious and beautifully appointed Fountain Suite is available for a wide range of occasions from Sunday Lunches through to Wedding Receptions. Full details of this together with the adjacent Terrace Room can be found in the Hospitality section of this website. Both rooms feature lovely course-facing views. The ground floorl houses the Pro Shop, changing rooms, Spike Bar and a Sports Lounge featuring a large wall mounted screen TV. The golf course, designed by David Williams, meanders through dramatic rolling countryside populated by thousands of mature trees which further enhance the appeal of this beautiful setting. The topography of the course is extremely interesting with two valleys merging at the northern end offering wonderful views over Farthing Downs with many other delightful scenes along the way. Holes run along valleys and ridges with mainly level play and many enjoyable down hill tee-shots offering a vista of the complete hole. There are two lakes (one teasingly situated alongside the 18th green in front of the clubhouse), carefully positioned bunkers, raised tees and tree-lined fairways. The specification and construction of the course is to the highest of standards with full USGA specification greens, drainage system, computer controlled irrigation of not only the greens and tees but also the fairways). Add to the mix the chalk based sub-soil and buggy paths and you have a great recipe for all year round play! "All of us at Surrey National are proud of our Club and we hope that with your enthusiasm for golf we can build on the reputation we've already earned as the best new Championship Design course in the Southeast of England. If you like your courses very hilly with loads of above and below feet lies then this is the course for you - there is almost no let-up. Unforgiving of good tee shots as ball rolls and rolls off the fairway. Tough track with lots of bunkers. Greens very hard and fast that certainly caught me out. Clubhouse could be more welcoming - my coffee and bacon roll was not good. The course is very picturesque - shame as I hear it has been sold for development - no surprise there! If you like North Downs this is better! Just the other side of the M25 near Caterham, the Surrey National is very much like North Downs but better. The massive contours of the region make this a very hilly course. Friendly staff, fantastic food, the best Bacon roll I've ever had by a mile. The fish n chips was restaurant quality. Played the event with the DGA all in with a buggy £40. It poured with rain all day but I still loved it. Maybe a slightly tougher course than North Downs, certainly the better layout in my eyes. The Greens even though hollow tined rain true. If you want a challenge and enjoy great food, look no further! Course in very good condition apart from the bunkers which could do with some sand. It's difficult to know what's wrong with this course the greens were excellent true & very tricky, every hole is difficult with the ball either above or below your feet on every fairway. It felt very bleak and seemed to lack any charm - maybe better in the summer?